A growing number of Florida residents are seeing increased risk for diseases related to excess weight and obesity, however many aren’t aware they should lose weight. The first step in the scientific method of solving any problem is to identify the problem. However, when it comes to obesity and excess weight, there is a growing population who are not aware they have serious health risks. And those who are on there way to a lifestyle that leads to obesity, like many college students for example. We’ve written another article about the unfortunate affect of media images on the perception of obesity. Contrary to what the media would have you believe, you don’t have to be an extremely large person to have obesity. Body Mass Index is an easy metric to calculate and it’s still the absolute best indicator for weight-related health risks. 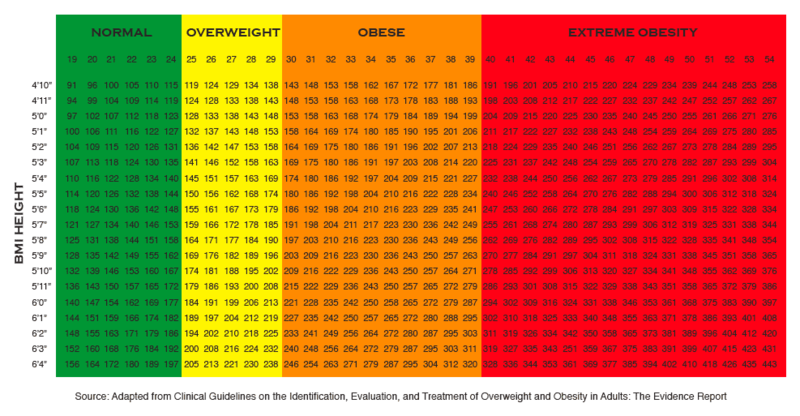 Below is a BMI chart. Find your height, then find your weight. The top row will tell you what BMI range you’re in. Now, what’s the main reason many fitness professionals don’t like BMI? Because you can be a muscular athlete and your BMI could be in the overweight or obese range. However, we’re going to assume that most folks have basic logic and aren’t going to tell a muscular athlete they are overweight based on a BMI score! The bigger concern with BMI actually, is that some people in the healthy weight range could still be at risk. Once your BMI is identified, a very helpful measurement is waist circumference. Medical guidelines advise that for an average height woman a 35″ waist is obese, 40″ is obese for an average height man. By combining your BMI and waist size you can get a very accurate picture of your weight-related health risks, aka metabolic health risks. To take this a step further and get an increasingly important metric for doctors, watch the video below to calculate your waist-to-hip ratio. If your BMI or waist is in the overweight status, you then should have a complete blood work-up to assess cardiovascular risks. But metabolic risks aside, excess weight is also related to joint pain and back problems, so the best course of action is to find a plan to achieve healthy BMI and waist measurements. MyWeightClinic.com partners throughout Florida can help assess your risks and provide additional insight on ways to lose weight and lower your risks for weight related diseases. Dr. Shebovsky is a 20 year Chiropractic Physician who specializes in Nutrition and Weight Loss. He owns a 4 provider primary care and wellness center including a weight loss clinic in Orlando, FL.